Email marketing is a MUST for any personal trainer who wants to grow their online business. Yes, establishing a presence on Facebook, Instagram, YouTube, and all the other social media platforms can help, but email is one form of digital communication that has stood the test of time, and it's not going anywhere any time soon. People email for their own personal use and they use it for business. That's why statistics show that 333 BILLION emails will be sent each and every day by the year 2020. No, email marketing is not going away. It's obvious that email is a powerful way to connect with your clients and prospects, but in a world where there are billions of emails sent each day, how can you make sure yours get opened and read? Should I sent a monthly fitness newsletter? Should I send the same stuff I post on social media? Should I sell my coaching services through my emails? Should I send different emails to prospects vs. buyers? Are your emails getting an acceptable (and eventually an awesome) OPEN RATE? Your open rate is simply the percentage of your email list who actually opens the emails you send. If people aren't even opening your emails, the content within those emails doesn't matter. That's why you need to focus on your open rate, and then perfect your content and your call-to-actions. The #1 factor dictating whether or not your emails get opened is your subject line. A good subject line can mean the difference between having 5-10% of recipients opening your email and 30%, 40%, even 50% or more opening it. Understanding how to write captivating email subject lines is crucial. When I first began building my email list, I had 8 subscribers. Yes, eight. They were my current one-on-one personal training clients. I focused on growing my list and soon it hit 100 people, then 1,000, then 10,000, and now I have over 30,000 subscribers. Every open rate percentage point matters. For example, say you have 100 people on your email list and you send a series of sales emails to get people to join your new $200 online fat-loss program. If your offer is positioned correctly, you might get 30% of people to buy once they learn the details of your program. Now, if you have a poor open rate of 10%, that means you'll earn roughly $600. However, if you nailed down a good subject line for your emails, your open rate could easily hit 40% and you'd come away with $2,400. That's real money being left on the table if people don't open your emails! As shown in the graphic above, when done well, the return on investment for email marketing far surpasses all other forms of online promotion you can do. BUT, this all hinges on having enticing email subject lines that get your message read. The following list of 117 email subject lines is yours to use however you like. 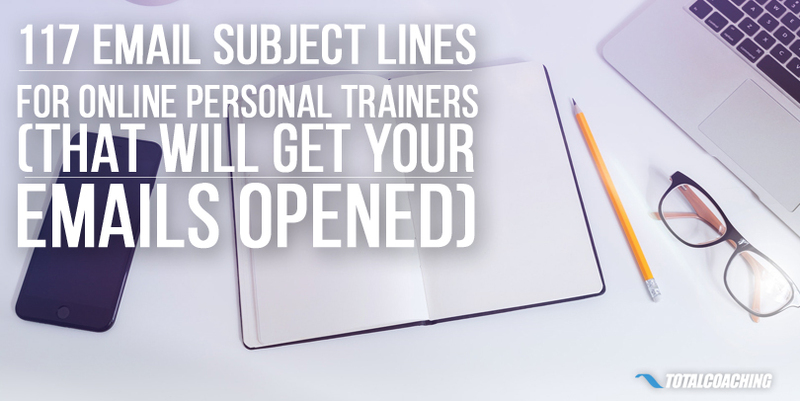 You can use these subject lines with promotional emails to sell your online fitness products or services. You can use them to nurture your prospects. You can use them to drive traffic to your online content. Just remember, the subject line should be related to the message within your email. People open an email based on a "promise" you're making in subject line. Once they open that message it's your job to deliver on that promise. So, don't use the subject line, "Did you forget to register?" to get people to open your email that sends them to your recent blog post. If there's nothing to register for, don't mention registration in your subject line. Be honest. Deliver on your promises. IMPORTANT… Link Was Wrong…Use this Link! Your 2nd chance- Y or N? Yes, I will do it! [FINAL NOTICE] This is it…. I'm very sorry…But you NEED to see this! Tick-Tock, TICK-TOCK…Time Is Almost UP! What ONE Question would you ask me? Shhhhh… it's a secret sale! FW: do you know this? Can you make a split-second decision? I've just about HAD ENOUGH. Did you leave a comment? Which one of these email subject lines are you going to try first? Tell us in the comments section below.